Manage your sprint retrospective agenda and track follow-up work with our template to keep improving your team's work and processes. Retrospectives are an important part of the Agile process. They help teams reflect on wins while homing in on what can be improved for next time. Without a clear meeting agenda and a way to follow up on action items, these meetings can get off track and not actually lead to process improvements. 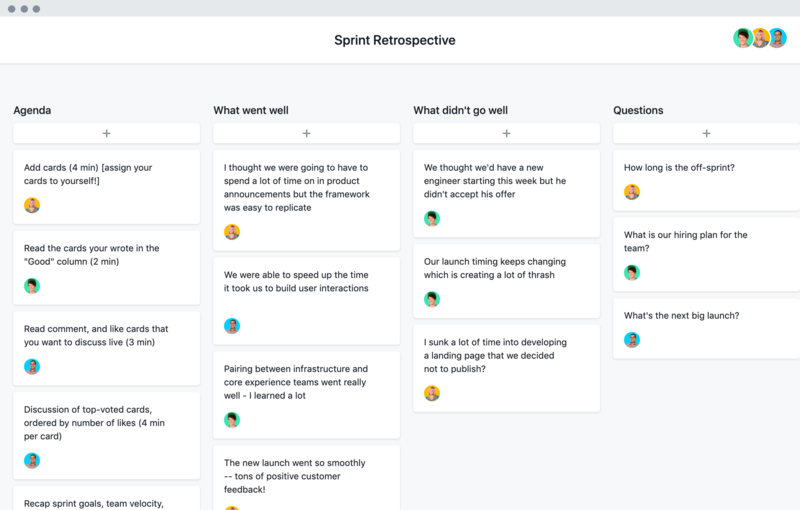 By tracking discussion topics, feedback, and actionable to-do’s in our sprint retrospective template, teams can continuously improve their work, without reinventing the wheel. Give structure to your retrospective. It can be easy to get off track when discussing sprint feedback. Our template ensures you stick to the schedule by making it clear before and during your meeting. Take action on insights. Retrospectives are all about improving processes and future work. Our template makes it easy to create and assign out action items and follow-up work to make sure ideas don’t slip through the cracks. Save time and iterate. You don’t have to reinvent the wheel every time you run a retrospective, nor do you have to stick to the same format. Our template makes it easy to standardize your agenda, while being flexible enough to update it as time goes on. Prep your team for faster-paced sprints and finish strong with our tips. See how to get all your Agile work into Asana. Teams turn to sprints to work more efficiently, and paired with Premium, teams can work 45% more efficiently.